Window treatments add beauty to our home and they also help block the sun rays in our rooms as well as add privacy. However, sewing them can be a challenge. Fabrics used in making draperies are typically thick and heavy especially when you have big windows. This is why you need to choose a sewing machine that is best for window treatments. Don’t just consider a major brand and buy one, look for specific specifications to consider when purchasing. Adjustable Speed: It is good to choose a sewing machine with adjustable speed especially when you’re a beginner. This will help you control the stitches and you can slow it down to avoid messing it up. Adjustable Stitch Length and Width: Since you’ll be dealing with long and thick fabrics, make sure that the sewing machine you’ll be choosing has an adjustable stitch length and width. Variety of Presser Feet: The presser foot is responsible for holding the fabric while you sew. Make sure that the sewing machine has variety of this to hold different width and textures of fabric. Different Stitches: Window treatments are made of different designs that is why you need a sewing machine that offers a variety of stitches to help you create great designs. Automatic Needle Threading: Having this feature is very helpful especially when you will be using heavy duty threads. Automatic Thread Cutter: This will help you cut heavy weight threads easily when sewing large pieces of fabric. Automatic Tension Control: This feature is very helpful when you need to sew fabrics with different weight and texture together. Free Arm and Extension Table: Since you’ll be sewing large pieces of fabrics, it’s important to have enough space to stretch them out. High Stitch Counts Per Minute: This feature can help sew longer fabrics faster. Though, it’s not that advisable to speed sew window treatments because of the details you have to pay attention to. This sewing machine is best if you plan working on variety of fabrics. It can handle any kind of materials especially thick and heavy ones. It has a smooth quality stitching which is good for heavy duty threads. However, this model does not have variety of stitch styles and it is also not computerized. This sewing machine is portable, easy to carry, and to store as well. It is only 14.6 lbs. It is computerized and comes with a lot of features in a very affordable price. It can support 750 stitches per minute which is quite fast, and it comes with 100 different stitch types. This is great if you plan on sewing curtains with a lot of designs. This one is an advanced computerized machine that comes with 11 presser feet. This sewing machine is great for those sewing enthusiasts with accomplished levels. It comes with 294 different styles of stitches which are a lot. Imagine how many different designs you can create with that number of styles. If you’re looking for a durable sewing machine, this one is perfect for you. This model is popular because of its endurance and quality. It comes with 18 stitch styles and can sew 1000 stitches per minute. However, it is not computerized and does not have an auto thread cutter and an auto thread tension. 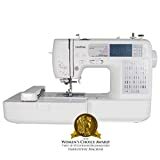 This heavy duty model offers a high-power motor if you’re looking for a speedy sewing machine. It can sew 1100 stitches per minute and it can handle any fabric weight. This is best if you will be working with long fabrics. Though, this machine is not computerized and it does not have the auto thread cutter feature. If you’re a novice or an advanced quilter, this model is best for you. 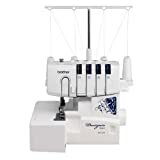 It has a programmable needle position feature which is very helpful when sewing heavy drapery materials because it allows you to select the needle position between up and down. It also has a spacious sewing surface which is best for curtains. It also comes with 98 stitch styles. The only thing it lacks is the auto thread cutting feature and the free arm because it already has a spacious sewing surface. These are just some of the best sewing machines you can choose from for window treatments. Purchasing one will still depend on your needs, as well as your comfortability in using the features and your budget. If it will be for your hobby or home use only, you might want to consider buying an inexpensive one to get started. However, if you’re going to use it to produce a lot of window treatments for a business, then the heavy duty ones are the best choice and you should carefully consider each option..